Audio Pro Addon C10 review | What Hi-Fi? What Hi-Fi? Awards 2018 winner. Another class-leader from a company currently on a roll. You could probably save some time by skipping this review for the Audio Pro Addon C10, and simply holding our verdict on the Addon C5 closer to your face and reading it again. 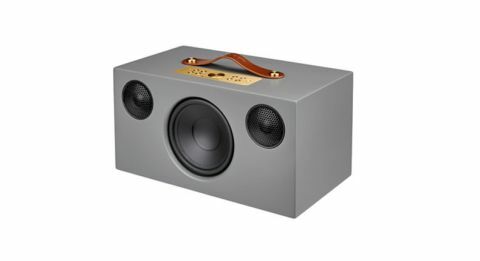 Granted, this might not be the most appropriate way to acknowledge the C10’s greater performance in almost every regard, but it would serve to demonstrate that this is another barnstormer of a wireless speaker from a company that can seemingly do no wrong just now. Another benefit is that it would save our photographer some work. Apart from the rear inputs having been slightly rearranged, physically the Addon C10 is just a scaled-up version of its smaller sibling. That familiar driver configuration, featuring the koala design that has become these speakers’ distinguishing feature, is present once again. Only this time, the mid/bass has grown to 13cm from 10cm. Coupled with a larger reflex port to the rear and an 80W digital class D amplifier, double that of the Addon C5, it means the Addon C10 can reach an extra 5Hz into those bass frequencies – and with a lot more authority too. Despite being heavier set, the Addon C10’s connectivity diet is the same as the rest of Audio Pro’s multi-room family. You can feed it via wi-fi, Bluetooth 4.0 and AirPlay, as well as through its physical inputs for aux and RCA. There’s also the benefit of Spotify Connect, but we’d be more inclined to use the Audio Pro control app, where you’ll be able to set up multi-room facilities for all the C-series products. However, it’s just as intuitive for a single speaker, offering easy access to a number of major streaming services, including Spotify, Tidal and Qobuz. It’s also where you’ll be able to temper bass and treble frequencies. It’s a basic, two-way control, rather than offering full EQ settings, but could be useful if the Addon C10’s generous low-end becomes overpowering, or for fine-tuning if making use of its subwoofer-out connection. The beauty of these Audio Pro speakers is that they resist the temptation to overcomplicate things – part of the reason why three of them took home What Hi-Fi? Awards in 2017. While relatively feature-laden, their design is geared towards unfettered sonic performance, and that is where each rises effortlessly to the top of its class. The Addon C10 is not only the biggest sounding of Audio Pro’s offerings, but also easily the best. To begin, we play Nils Frahm’s All Melody. The scale of the sound is immediately impressive, digging down into the low frequencies with an assured combination of warmth and punch, but also affording the presentation an extra dimension in terms of layering. The Addon C5 is a notably mature performer, revealing all the textured detail from instruments, but even its own performance appears to be quite forward compared to the three-dimensional organisation of its bigger brother. Despite its size and muscle, the Addon C10 is also equally adept at capturing the subtler, more nuanced performances on this record. Those more gentle, piano-led pieces aren’t dealt with the heavy hand sometimes to be expected from such a powerful wireless speaker. Instead it uses the extra room and warmth of that bottom end to paint broad but delicate strokes focused on dynamics and insight. With most of these units’ workload likely to centre on vocal-led tracks, it’s fortunate that the Addon C10’s talents easily lend themselves to such performances. Playing TV On The Radio’s Seeds, Audio Pro has again nailed the combination of mid-range focus, held up again by that solidity lower down the frequency range, and expression in Tunde Adebimpe’s vocal. The C10 ties together harmonies without ignoring the detail in the differing vocal timbres that make up the set. This is also an opportunity for the Addon C10 to flaunt its exceptional sense of timing. The extra bulk in its presentation does nothing to slow its footwork, only allowing it a firmer kick. Coupled with that aforementioned dynamic range, it not only keeps time wonderfully but also has no trouble adding impetus to the leading beats that define the rhythms. At some point, Audio Pro’s supremacy in the wireless speaker market is bound to wane, but with each Addon release, that date seems to be further off in the future. Adding multi-room functionality to the range was a no-brainer, because you can never have enough of these speakers in your house. If you already own some of the Audio Pro arsenal, the Addon C10 is a worthy addition.